Thor Marvel Comics Video Slot Guide & Review - Casino Answers! Thor is a 5-reel, 3-row, 9-line Marvel Jackpot Slot. It has scatter wins, a free spins feature and is linked to three progressive jackpots. The Thor slot machine is based on the Marvel Comics character. You can play the Thor Marvel video slot at Casino Joy.Play at this years #1 online casino for United States - Slots.LV. You may bet $0.05, $0.10, $0.15, $0.20, $0.25, $0.50, $0.75, $1, $2, $3, $4 or $5 per line on Thor, and up to 9 lines. The maximum bet is $45 per spin. There is an advanced autoplay feature, with the ability to stop on any win above your selected amount, stop on cumulative wins or losses, stop on free games or stop on jackpot. There is also a speed feature where you can choose between Normal, Fast and Very Fast speeds. If you’re playing single spins, you probably won’t need this. If you’re playing 999 spins on autoplay, it may be a good idea. The Thor slot machine is linked with three Marvel Progressive Jackpots: Hero (starts at $50), Super Hero (starts at $500) and Marvel Hero (starts at $5000). Any spin can win, even ones with no matching symbols. You will increase your chances of winning by betting more. 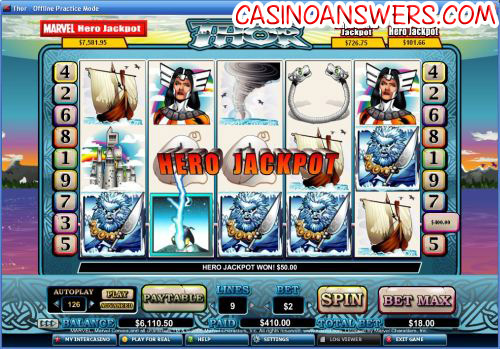 The jackpots are won very frequently… We were able to win the small Hero Jackpot twice! If three scattered Thor logos appear on a spin, 10 free spins will be awarded. During the free games feature, prizes will be tripled. You can win more free spins during the feature. Free spins will be played with the same number of lines and bet amount as the triggering spin. At the end of your free spins, the wins will be added to your payline and scatter wins. 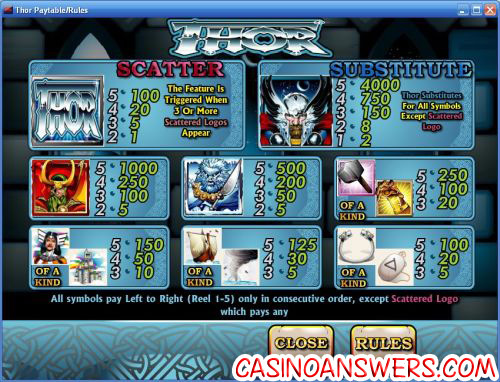 Thor’s pros lie in the free games feature, the excellent graphics and animations and the three Marvel Jackpots. The customization features also don’t hurt. The main negative is the lack of a bonus game that most of the other Marvel Jackpot Slots have. Still, if you don’t need a bonus game, are a fan of the Thor character and are looking for a 9-line video slot, you can play Thor now at Casino Joy. I’m a casino player from the United States. Are there any US-friendly casinos that carry the Thor video slot? All of the casinos where you can find Thor available to play for real money are not accepting US players. We recommend you check out some of the many slots over at Bovada Casino. For players outside the United States, please read our Bodog Review. Does the Thor slot machine have a bonus game? Thor does not have a bonus game. Instead, you get a 3X multiplier on the free spins feature. If you’re looking for a Marvel Jackpot game with a bonus feature, please read our Wolverine Marvel Jackpot slot review. What marvel slots are there? Is there a Thor slot machine?